The best way to organize education by tutorials from YouTube. 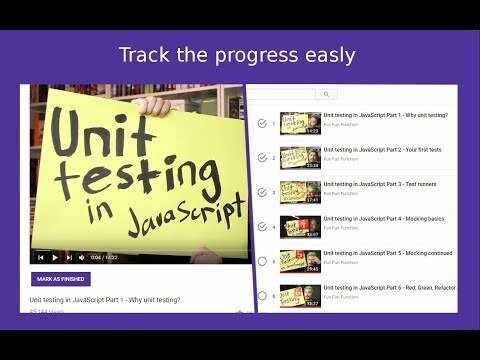 The extension extends the functionality of YouTube: adds the opportunity for collecting playlists as courses, tracking the progress of training, recommend the list of quality-tested by a large number of users and more. YouTubeTutor was added by dnerdster in Mar 2018 and the latest update was made in Apr 2018. The list of alternatives was updated Feb 2019 There is a history of all activites on YouTubeTutor in our Activity Log. It's possible to update the information on YouTubeTutor or report it as discontinued, duplicated or spam. An e-learning platform offering courses on programming, software skills, and other subjects. Tutorialzine is a site dedicated to bringing you the coolest web development tutorials and resources. Online training through LinkedIn's professional network. Alternatives to YouTubeTutor for Web, iPhone, Android, iPad, Android Tablet and more. Filter by license to discover only free or Open Source alternatives. This list contains a total of 19 apps similar to YouTubeTutor. No reviews yet for YouTubeTutor, want to be first? Maybe you want to be the first to submit a comment about YouTubeTutor? Just click the button up to your right!